For some time, I have been studying exosomes and their effects. This is relatively new field although many studies have emerged in the last few years. It is now clearer that extracellular vesicles (aka exosomes) they are the primary method of communication between stem cells the other cells of the body. When you have a problem stem cells produce exosomes to help resolve whatever infection, malignancy, dysregulaton, or degeneration is occurring. 1.) In high school biology, they have taught that the Golgi apparatus packages proteins into vesicles. 2.) The proteins and RNA that modulate cell behavior can’t survive in the blood stream long without protection. The upshot is that the MSCs are communicating, controlling, and reprograming other cells, via these tiny spheres of RNA and proteins that travel in the bloodstream and bind to the target cells. Very few things in anti-aging get my full-throated credence but in this case, seeing was believing. 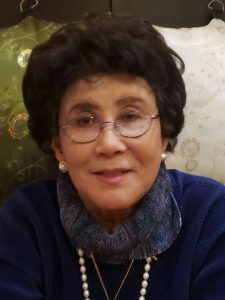 A few days ago, my own 82-yo mother was brave enough to allow me to give her exosome therapy intranasally and intravenously; the results were astonishing. She told me the next morning that she looked and felt different and being skeptical by nature, I had to drive up the next day and see for myself. This is her trying her first empanada one day after therapy. She indeed looked much less tired than I am used to seeing her. Yesterday was three days after treatment, she truly looked younger and her energy was amazing. 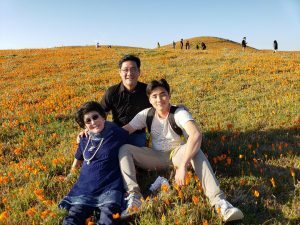 She even went on a hike to see the poppy fields with me and my son and drove us home at the age of 82. Her blood pressure continues to be improved for no apparent reason and she has had to lower her dose of medications now. A few months back, fate had me get to know Duncan Ross, the founder and Chief Science Officer of the main exosome manufacturing company, Kimera. The lecture he and some colleagues gave at the anti-aging conference was “the best I’ve seen in twenty years of coming” according to one of the doctors sitting next to me. That night, I was invited to dinner with Dr. Ross and his senior team that and I was impressed by his background, candor, and rigorous attention to quality. 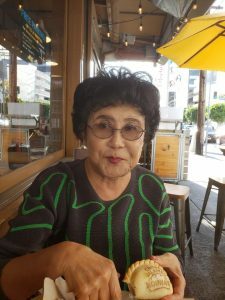 As a result of my research, personally meeting the team that produces the exosomes, and my own mother’s experience, I am very excited to now offer this treatment in my practice. Such a game-changing therapeutic may not be available for long and currently it remains off the FDA/FTC radar. As a medical doctor, I am able to use this new technology in the context of physician-patient relationship in an “off-label” way as long as it is done with best practices and informed consent. I plan to do comprehensive assessments with PhysioAge testing, telomere, epigenetic, and immune age testing as part of the regiment to document changes. I will also be making “house calls” throughout the continental US because I truly believe this will be a game-changer for disease mitigation and rejuvenation and I can’t wait to offer it and help people. The benefits of this treatment are the ease of administration, inherent safety, known infection-free and non-abortive sourcing, and total lack of cellular and immune rejection. One size fits all because there are no self-identity antigens as with cell treatments which can be rejected by your immune system. Each treatment vial contains 5 billion MSC-derived exosomes produced by single-source, healthy placental tissue from cesarean section and extracted under the highest quality standards. If you or someone you know might be interested in learning more, please email me at drpark@rechargebiomedical.com to be put on an interest list. If you would like a brief phone consultation to learn more, include your phone number and the best time to call and I would be happy to share more information. The cost is high because of the difficulty in maintaining and harvesting the exosomes but not since the early days of TA-65 have I felt that there was a game-changing intervention like this with the safety and efficacy required. When your body needs repair, MSCs are called. Now we can have their beneficial effects without the problems that can be associated with cellular therapy. The reason intranasal administration is required is that the exosomes can easily access the central nervous system and hopefully reduce inflammation and reprogram regeneration. IV administration goes throughout the whole body and avoids the clumping and lung trapping of MSC cell therapy. Finally, application into and around joints with ultrasound guidance as well as topically for skin rejuvenation are all modalities currently being used by licensed physicians at the cutting edge of this breakthrough technology. More information will follow in future blogs. I just read your latest article on this new MSC therapy. I remember talking to representatives from Mexico at the Las Vegas Health Convention promoting their own methods of Stem Cell therapy using injection methods. Is this latest stem cell treatment similar? It sounds like you have modified your stance on the effectiveness of stem cell injection methods. It will be interesting if this stem cell derived exosomes injection therapy can be transformed into a capsule form that can be orally administered. 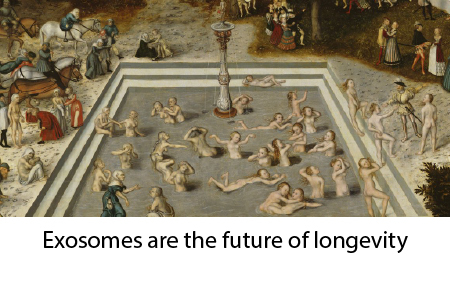 Esosomes therapy may also improve the body’s effectiveness to produce higher quantities of telomerase in older people in conjunction to taking telomerase stimulators such as TA-65. Keep me posted. I am happy that you are continuing to discover new and effective ways to heal people by natural and safe methods starting at the DNA level. I was thinking that it was time you needed to have other genetic healing weapons in your arsenal besides TA-65 and Recharge in order to continue your work in this important part of anti aging therapies. 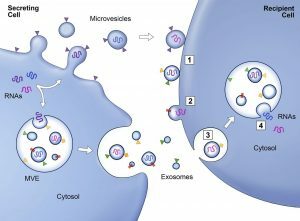 exosomes sounds like something I have been dreaming about. Hi, Victor. I am also very excited about helping some sick people regain their health and wellness. I will add you to the interest list! Yes I am interested in Exosomes treatment. What would be the cost and where would the treatment be given. I am currently in AZ but am moving to WI in 2 or 3 weeks. I would say people with bad joints and chronic CNS problems. There may be a general benefit but it helps if there is something that needs fixing. Hi Roger, my reasons for using my mother was that she was unlikely to sue me and I want to make sure that she lives as long and well as possible. My reasons for giving myself the exosomes were to make sure it was safe, had some effects, and that I had some clinical data points to reference. If I am going to provide this therapy, I should be brave and confident enough to take it myself, right? Stay tuned for more about exosomes generally and more clinical anecdotes. In the meantime, I recommend watching Douglas Spiel on YouTube and his mentor’s lectures, Dr. Arnold Caplan.